Over the last year, my loyalties have dramatically shifted towards natural skincare lines. It took a heavy usage of retinols and glycolic acid to transform my skin into looking fresh, smooth, and acne-free a couple years ago, but since then, it seems my skin remains tempered without use of those strong ingredients and feels completely changed. So I wanted to do away with the harsh stuff and try to maintain balance within my sensitive skin with natural, clean products. After trying many different brands, I've found my hero products in Jurlique and Yon-Ka, two natural lines based in Australia and France, respectively. While using both brands, I've noticed a radiant glow in my skin, a plumpness that shows proper hydration and vitality, and rarely any problems like acne or sensitivity. I want to share with you my entire skincare regimen I'm currently on and hopefully you and I can both discover and discuss new products to continuously better our skin! 1. Yes to Cucumbers facial towelettes: Refreshing facial wipes with a pleasant, light cucumber scent that takes away all dirt and makeup, leaving your skin squeaky clean. I love using these at night as I'm usually way lazy to wash my face in the sink. 2. Jurlique Soothing Foaming Cleanser: A milky cleanser that leaves your face smooth, hydrated, and glowing. It just feels like a spa when you're washing. One of the best cleansers I've ever tried. Also works great with the Clarisonic. I love that Sichuan Peppercorn is one of the main ingredients as it's something I love to eat and a big part of my Sichuan heritage. 3. Yon-Ka Guarana Scrub: gentle exfoliating cream with guarana and organic brown rice that feels so smooth and silky. Really hydrating and again leaves your skin glowing. 4. Jurlique Herbal Recovery Antioxidant Gel Mask: Absolutely love this! Revitalizes your skin with Vitamin E beads and Willow Bark Extract, leaving your skin (you guessed it) glowing with an intense boost of hydration and antioxidant protection. 5. Arcona Trial Pads: Cranberry milk toner, cleanser, and hydrator in one conveniently pre-soaked in cotton pads. Delivers antioxidants with a quick and refreshing swipe. Leaves a glow (glowing skin is obviously my requirement of skincare). 6. 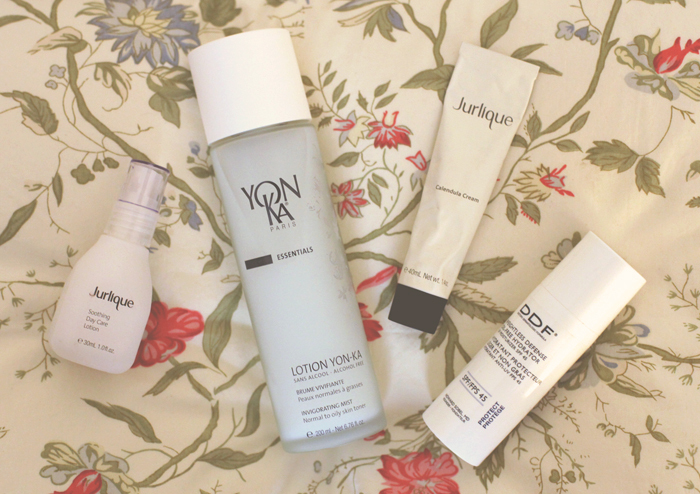 Lotion Yon-Ka: An amazing toner that energizes your skin with a couple mists. I gently press the toner into my skin rather than leaving it sitting on top. I use this throughout the day to freshen my face. 7. Jurlique Soothing Day Care Lotion: A lightweight, non-greasy moisturizer that is hydrating enough for dry skin. Contains Vitamin E for more antioxidant protection. Leaves skin super soft and comfortable. I use this every day in the morning and I use the pressing technique (on all my products) as it helps to absorb quicker and deeper into your skin. 8. Jurlique Calendula Cream: A more intense cream that delivers a punch of hydration to your face and that calms down any redness or sensitivity there may be. I use a light layer throughout the day or solely as a night cream. 9. Kiehl's Rosa Arctica Eye Cream: I haven't made the switch to a natural eye cream yet, but this Kiehl's one delivers! My eyes feel moisturized and plump and they look brighter. Not in a hurry to switch just yet. 10. DDF Weightless Defense Oil-Free Hydrator SPF 45: says it all in the name! Super lightweight yet completely moisturizing and absorbs fast. A perfect and essential addition as the finishing touch. What are your hero products? If you want to try Jurlique and Yon-ka, you can find them online (linked above) or at your local Whole Foods (isn't their beauty section amazing btw?). Win a pair of Dr. Scholl's Shoes! Vote for me, thank you! Hi Carina! I used the retinol and glycolic acid products day in and day out for about a year and a half, and slowly started phasing them out. I'm glad they are working for you! It's a nice anti-aging product to use once in a while, so I haven't sworn them off completely. I highly suggest looking at Whole Foods as their natural beauty section is much higher quality and bigger selection of natural lines than what you might find in drugstores and even department stores. I think Jurlique soothing lotion and calendula cream are great products to go with your gly-c regimen as they are calming. Thanks for reading! Sounds great! I'm in the process of switching over to all-nautral vegan products.